Out came pens and inks to accompany the drinks people had. Hauls were shown off. Inks were swabbed and discussed. Pens were filled. A grand time was had by all. Once everyone seemed settled for the moment, I took my Visconti Homo Sapiens Bronze Age (VHSBA) over to Oscar. I asked if he was still willing to work on it. Unfortunately, he’d apparently planned to fix overnight or the next day, and I wasn’t going to be at the show on Sunday. I was about to tell him not to worry about it, I’d just send it to Visconti, when he said he’d make sure it got fixed. I thanked him and happily retreated to my table because I don’t know anyone who isn’t bothered by someone hovering over them while they’re working. Mike Allen ended up joining my table and checking out some of my pens. And I got around to filling the Spring 1 pen I’d purchased from him with Poussiere de Lune. From this point forward, I’ll just be writing about things I remember, because I guarantee, I’m going to get the order of things wrong. I was having way too much fun to remember to take much of any pictures, and honestly, the overwhelming aspect of my memories of that night is that it was welcoming and fun. 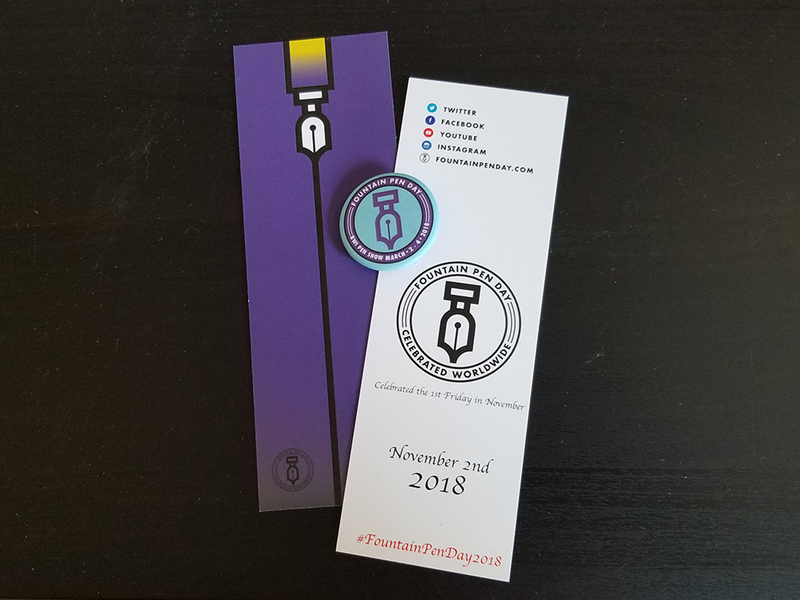 At some point, Mr. Yeager handed out FPD buttons and bookmarks. Now, I know I’m easily amused, but I’ll admit to spending a few moments just appreciating the smoothness of the button. For those who aren’t familiar with them, they have a matte finish and are so soft that I just want to rub them against my face like you would a fluffy blanket. He also passed out paper to enter a giveaway. I put down my name, although, having recently won a box of Bungubox Ink from Goldspot Pens, I figured my chance of winning was next to nothing. I have notoriously horrible luck when it comes to giveaways, raffles, etc. Hands down, the best part of the night was Ralph coming over with my fixed VHSBA. I uncapped it and wrote all of five words before I was hooked. It was a little on the wet side and so very smooth. I (very carefully) capped my pen and set it down, then jumped up and pulled Ralph into a hug. I really hope he didn’t mind. I was just so happy to have a properly functioning pen. The adjusted nib was everything I wanted. 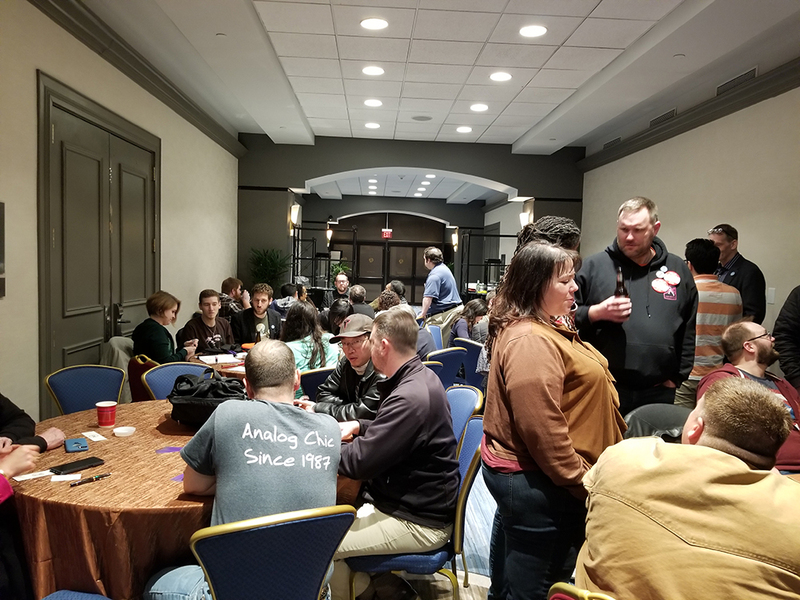 It was better than the pen I’d written with at the DC meetup, and that was already amazing. I honestly don’t have words to describe just how much I love my VHSBA now that it’s been adjusted. I don’t know if Oscar and Ralph worked on it together, or if Ralph worked on it alone, but because Ralph is the one who actually brought it over to me, I’ve officially dubbed it the Ralphy Sapiens. Although perhaps I should name it the Ralphy O. Sapiens, because if absolutely nothing else, Oscar facilitated the creation of it. Once the giveaway started, we all got really quiet. I was surprised by just how many things were given away. Jim won an Aurora pouch. And, while I was occupied with my VHSBA, my name was announced. Turns out I won this cool travel mug. 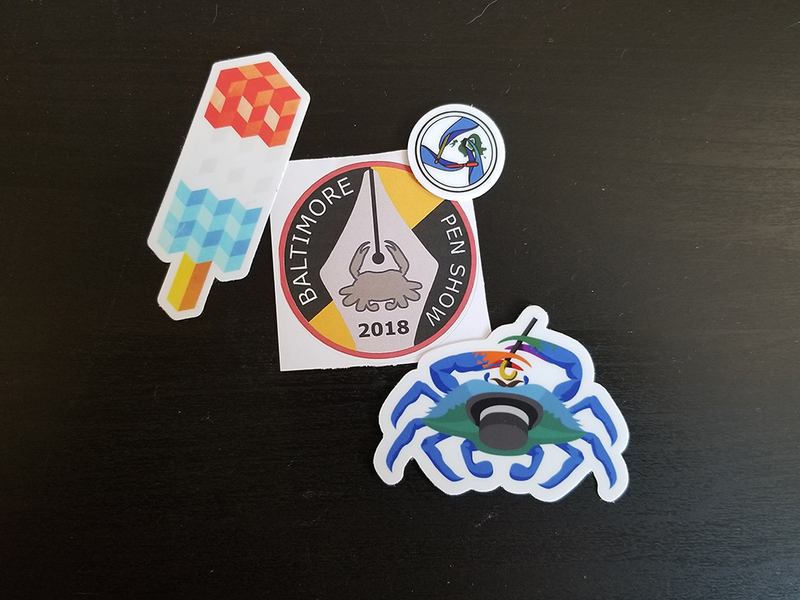 It’s a neat design, but it wasn’t until after the giveaway was finished and Jason told me the story behind it that I really appreciated my prize. I joined the pen community too late to meet Susan Wirth. There are plenty of people who can, and have, told amazing stories about her and her work. So I don’t think I need, or should, do that here. But the short version of the stories Jason told me is that Susan liked either gin and tonic or vodka tonic (I’m sorry I can’t remember which), and had it with her often enough that it became known as her “Pen Show Water”. 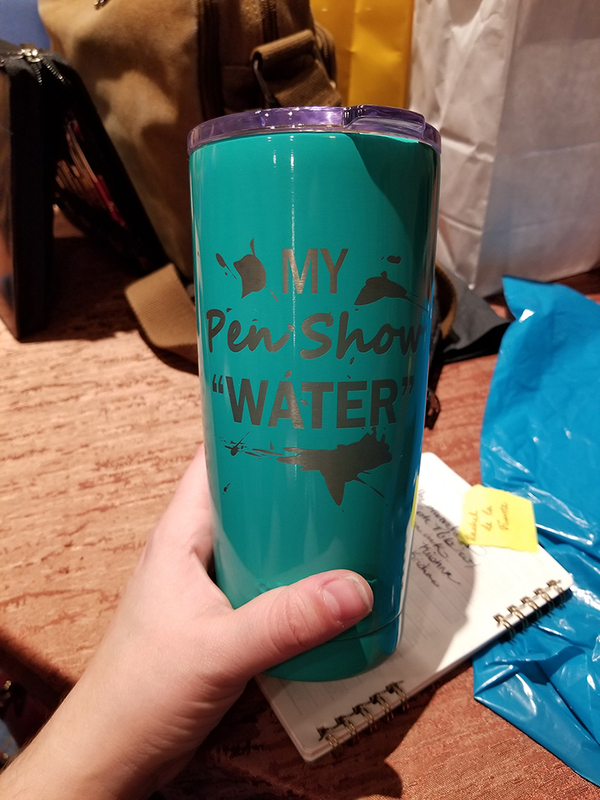 So now I have my own pen show water which will, honestly, be water. It wasn’t long after the giveaways that Jim and I decided we ought to be heading out, since we still had the drive home ahead of us. Well, that was easier said than done. Each person we wanted to say goodbye to was another person to chat with for a little while. Next thing we knew, another half hour had passed. Then an hour. Somewhere in there Adam showed up and I shared my VHSBA with him, Visconti fan that he is. Honestly, if the group hadn’t been kicked out of the hallway to allow for clean-up, I don’t know when we would have finally left. But, rather than join the crew that seemed to be heading for the bar, we decided to make our way home and end our day at the pen show. After all, it was nearly 11:30. It was time to go home. I met Susan Wirth for the first time – and what would sadly be the last – at last year’s BWI Pen Show. She was truly larger than life and I will never forget how she gave me the biggest hug when I told her I wanted to be her when I grew up. “That’s the nicest thing anyone has ever said to me!” she said. I am sorry I will not get a chance to know her better, but she was such a paragon of the pen community that her memory lives on. She was a gin and tonic fan (as am I, especially in the summer) and from now on at every show I will raise a G&T in her memory. She really sounds like an amazing lady. I’m not much of a drinker, but I’m sure whenever I hear gin & tonic I’ll think of her.